Economical Kit Ideal for Individual Student Use. 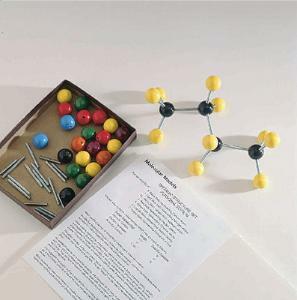 Start students off simply, with the basic components of organic molecular structure. Pre-drilled wooden balls represent atoms, while three different lengths of springs represent different types of molecular bonds. The set comes with instructions; 30 springs 1", 1 1/8", or 1 1/2" long; and 35 pre-drilled, colored wooden balls 3/4" in diameter: six carbon (black), two nitrogen (blue), 15 hydrogen (yellow), four oxygen (red), four chlorine (green), two bromine (orange), and two iodine/fluorine (purple).